Zerorez® , a national carpet and living surfaces cleaning franchisor, continues its expansion across the country, with its fourth Eastern Region opening this year. Superior cleaning results with its patent-pending and “green” cleaning system are key to Zerorez’ continuing success. The DC Metro follows openings in Springfield, MA, Pittsburgh, PA, and Albany, NY. The DC Metro area encompasses Northern Virginia and several counties in Maryland and represents one of the wealthiest and most powerful marketplaces in the world. Now it also boasts the home of Zerorez of DC Metro—the newest Franchise in the expanding Zerorez system. 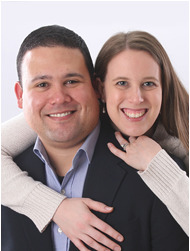 The principal owners of Zerorez of DC Metro, Luis, and Lindsay Padilla, have lived in the DC Metro area since 2007. “This is a great place if you like to be busy and immersed in a variety of activities. We love that the area allows for a short drive to Virginia vineyards, downhill skiing in Maryland and Virginia, while also having the option to enjoy the museums and monuments in DC. There's also a plethora of national sports teams including hockey, basketball, baseball, and football,” said Lindsay. Luis and Lindsay will leverage their strong professional backgrounds and experience to build the Zerorez brand in the Washington DC area. Luis has over 10 years experience working in professional IT services that catered to a multitude of clients where he provided high-quality service and project management. Lindsay also has over a decade of experience in communications and event management, providing high-quality customer service to multiple clients. Her background will be beneficial to manage the company’s marketing and call center. Luis is confident that area residents will embrace Zerorez. “We think the patent-pending and green cleaning concept is fantastic. Customers are looking for concepts that are safer for their families, and you can’t get safer than cleaning with Powered Water®! In addition, the customer service provided is world class. We know people in the Washington DC area will be excited to experience Zerorez’ carpet cleaning technology. In a time when companies are promoting self-serve business models and mediocre customer service, we will introduce a new era of customer service in the carpet-cleaning industry that will make ‘raving fans’ out of all our customers. “We expect to attract employees with positive attitudes, excellent customer service skills, a strong work ethic, and desire to be part of a fast-growing progressive team,” continued Luis. The Padillas are Zerorez Regional Developers and are also interested in identifying other franchise owners to further establish independent franchises in the DC area. The Zerorez concept was launched in 2001. Based on its Powered Water cleaning system, the founders intended to fundamentally change the carpet and living surfaces cleaning industry. Their answer was a comprehensive process using Powered Water, which is electrolyzed and oxidized to create a powerful cleaning solution without harmful toxins, soaps or detergents. Their research found that other cleaning processes leave dirt-attracting residue, which naturally leads to re-soiling, failing to truly provide a lasting clean. Zerorez Franchising Systems, Inc.’s corporate offices are in metro Salt Lake City, UT, and its franchise organization is coast-to-coast in 27 States. In recognition of its cleaning efficacy, the Carpet and Rug Institute (CRI) has awarded Zerorez its Platinum Rating, the industry’s highest rating. See http://www.zerorez.com for more information or to contact the Zerorez corporate office.